After two years of effort, the W3C Media Fragment WG has now created a Last Call Working Draft document. This means that the working group is fairly confident that they have addressed all the required issues for media fragment URIs and their implementation on HTTP and is asking for outside experts and groups for input. This is the time for you to get active and proof-read the specification thoroughly and feed back all the concerns that you have and all the things you do not understand! The media fragment (MF) URI specification specifies two types of MF URIs: those created with a URI fragment (“#”), e.g. video.ogv#t=10,20 and those with a URI query (“?”), e.g. video.ogv?t=10,20. There is a fundamental difference between the two that needs to be appreciated: with a URI fragment you can specify a subpart of a resource, e.g. a subpart of a video, while with a URI query you will refer to a different resource, i.e. a “new” video. This is an important difference to understand for media fragments, because only some things that we want to achieve with media fragments can be achieved with “#”, while others can only be achieved by transforming the resource into a different new bitstream. This all sounds very abstract, so let me give you an example. Say you want to retrieve a video without its audio track. Say you’d rather not download the audio track data, since you want to save on bandwidth. So, you are only interested to get the video data. The URI that you may want to use is video.ogv#track=video. This means that you don’t want to change the video resource, but you only want to see the video. The user agent (UA) has two options to resolve such a URI: it can either map that request to byte ranges and just retrieve those – or it can download the full resource and ignore the data it has not been requested to display. Since we do not want the extra bytes of the audio track to be retrieved, we would hope the UA can do the byte range requests. However, most Web video formats will interleave the different tracks of a media resource in time such that a video track will results in a gazillion of smaller byte ranges. This makes it impractical to retrieve just the video through a “#” media fragment. Thus, if we really want this functionality, we have to make the server more intelligent and allow creation of a new resource from the existing one which doesn’t contain the audio. Then, the server, upon receiving a request such as video.ogv#track=video can redirect that to video.ogv?track=video and actually serve a new resource that satisfies the needs. This is in fact exactly what was implemented in a recently published Firefox Plugin written by Jakub Sendor – also described in his presentation “Media Fragment Firefox plugin”. The temporal dimension, while not accompanied with another dimension, can be easily mapped to byte ranges, since all Web media formats interleave their tracks in time and thus create the simple relationship between time and bytes. The spatial dimension is a very complicated beast. If you address a rectangular image region out of a video, you might want just the bytes related to that image region. That’s almost impossible since pixels are encoded both aggregated across the frame and across time. Also, actually removing the context, i.e. the image data outside the region of interest may not be what you want – you may only want to focus in on the region of interest. Thus, the proposal for what to do in the spatial dimension is to simply retrieve all the data and have the UA deal with the display of the focused region, e.g. putting a dark overlay over the regions outside the region of interest. The track dimension is similarly complicated and here it was decided that a redirect to a URI query would be in order in the demo Firefox plugin. Since this requires an intelligent server – which is available through the Ninsuna demo server that was implemented by Davy Van Deursen, another member of the MF WG – the Firefox plugin makes use of that. If the UA doesn’t have such an intelligent server available, it may again be most useful to only blend out the non-requested data on the UA similar to the spatial dimension. The named dimension is still a largely undefined beast. It is clear that addressing a named dimension cannot be done together with the other dimensions, since a named dimension can represent any of the other dimensions above, and even a combination of them. Thus, resolving a named dimension requires an understanding of either the UA or the server what the name maps to. If, for example, a track has a name in a media resource and that name is stored in the media header and the UA already has a copy of all the media headers, it can resolve the name to the track that is being requested and take adequate action. And do not forget to proofread the specification and send feedback to public-media-fragment@w3.org. Today, I was invited to give a talk at my old workplace CSIRO about the HTML5 media elements and accessibility. A lot of the things that have gone into Ogg and that are now being worked on in the W3C in different working groups – including the Media Fragments and HTML5 WGs – were also of concern in the Annodex project that I worked on while at CSIRO. So I was rather excited to be able to report back about the current status in HTML5 and where we’re at with accessibility features. Check out the presentation here. It contains a good collection of links to exciting demos of what is possible with the new HTML5 media elements when combined with other HTML features. I tried something now with this presentation: I wrote it in a tool called S5, which makes use only of HTML features for the presentation. It was quite a bit slower than I expected, e.g. reloading a page always included having to navigate to that page. Also, it’s not easily possible to do drawings, unless you are willing to code them all up in HTML. But otherwise I have found it very useful for, in particular, including all the used URLs and video element demos directly in the slides. I was inspired with using this tool by Chris Double’s slides from LCA about implementing HTML 5 video in Firefox. Since On2 Technology’s stockholders have approved the merger with Google, there are now first requests to Google to open up VP8. I am sure Google is thinking about it. But … what does “it” mean? I believe – from what I have seen in the discussions at the W3C – it would only be that last step that will make companies such as Apple have the confidence to adopt a “free” codec. An alternative to providing indemnification is the standardisation of VP8 through an accepted video standardisation body. That would probably need to be ISO/MPEG or SMPTE, because that’s where other video standards have emerged and there are a sufficient number of video codec patent holders involved that a royalty-free publication of the standard will hold a sufficient number of patent holders “under control”. However, such a standardisation process takes a long time. For HTML5, it may be too late. It’s not simple to introduce a “free codec” and it will take time! That would put Theora in a better position to be universally acceptable as a baseline codec for HTML5. It would allow, e.g. Apple to make their own implementation of Theora – which is probably what they would want for ipods and iphones. Since Firefox, Chrome, and Opera already support Ogg Theora in their browsers using the on2 licensed codebase, they must have decided that the risk of submarine patents is low. So, presumably, Apple can come to the same conclusion. I see this as the easiest path towards getting a universally acceptable free codec. Over time then, as VP8 develops into a free codec, it could become the successor of Theora on a path to higher quality video. And later still, when the Internet will handle large resolution video, we can move on to the BBC’s Dirac/VC2 codec. It’s where the future is. The present is more likely here and now in Theora. Please note the comments from Monty from Xiph and from Dan, ex-On2, about the intent that VP3 was to be completely put into the hands of the community. Also, Monty notes that in order to implement VP3, you do not actually need any On2 patents. So, there is probably not a need for Google to refresh that commitment. Though it might be good to reconfirm that commitment. Today, it was announced that Google put their weight behind the Theorarm implementation by helping to make it BSD and thus enabling it to be merged with Theora trunk. They also confirm on their blog post that Theora is “really, honestly, genuinely, 100% free”. Even though this is not a legal statement, it is good that Google has confirmed this. At the recent FOMS/LCA in Wellington, New Zealand, we talked a lot about how Ogg could support accessibility. Technically, this means support for multiple text tracks (subtitles/captions), multiple audio tracks (audio descriptions parallel to main audio track), and multiple video tracks (sign language video parallel to main video track). The creation of multitrack Ogg files is already possible using one of the muxing applications, e.g. oggz-merge. For example, I have my own little collection of multitrack Ogg files at http://annodex.net/~silvia/itext/elephants_dream/multitrack/. But then you are stranded with files that no player will play back. As Ogg is now being used in multiple Web browsers in the new HTML5 media formats, there are in particular requirements for accessibility support for the hard-of-hearing and vision-impaired. Either multitrack Ogg needs to become more of a common case, or the association of external media files that provide synchronised accessibility data (captions, audio descriptions, sign language) to the main media file needs to become a standard in HTML5. As it turn out, both these approaches are being considered and worked on in the W3C. Accessibility data that are audio or video tracks will in the near future have to come out of the media resource itself, but captions and other text tracks will also be available from external associated elements. The availability of internal accessibility tracks in Ogg is a new use case – something Ogg has been ready to do, but has not gone into common usage. MPEG files on the other hand have for a long time been used with internal accessibility tracks and thus frameworks and players are in place to decode such tracks and do something sensible with them. This is not so much the case for Ogg. For example, a current VLC build installed on Windows will display captions, because Ogg Kate support is activated. A current VLC build on any other platform, however, has Ogg Kate support deactivated in the build, so captions won’t display. This will hopefully change soon, but we have to look also beyond players and into media frameworks – in particular those that are being used by the browser vendors to provide Ogg support. The current version of Firefox uses liboggplay for Ogg support, but liboggplay’s multitrack support has been sketchy this far. So, Viktor Gal – the liboggplay maintainer – and I sat down at FOMS/LCA to discuss this and Viktor developed some patches to make the demo player in the liboggplay package, the glut-player, support the accessibility use cases. There are still important questions open: for example, how will a player know that an audio description track is to be played together with the main audio track, but a dub track (e.g. 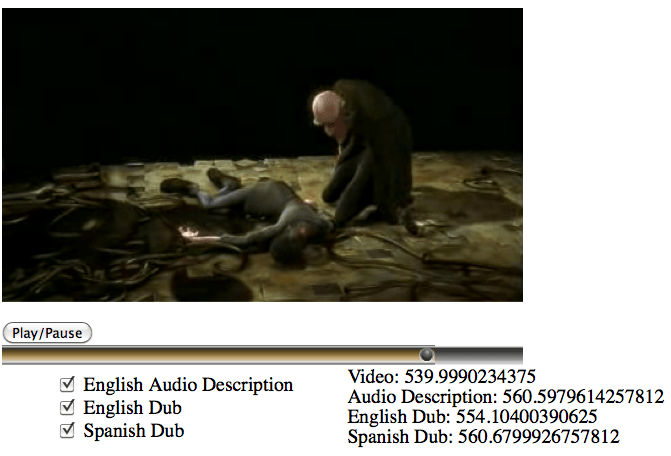 a German dub for an English video) is to be played as an alternative. Such metadata for the tracks is something that Ogg is still missing, but that Ogg can be extended with fairly easily through the use of the Skeleton track. It is something the Xiph community is now working on. This is great progress towards accessibility support in Ogg and therefore in Web browsers. And there is more to come soon. You probably heard it already: Linux.conf.au is live streaming its video in a Microsoft proprietary format. Fortunately, there is now a re-broadcast that you can get in an open format from http://stream.v2v.cc:8000/ . It comes from a server in Europe, but relies on transcoding here in New Zealand, so it may not be completely reliable. UPDATE: A second server is now also available from the US at http://repeater.xiph.org:8000/. Today, the down under open source / Linux conference linux.conf.au in Wellington started with the announcement that every talk and mini-conf will be live streamed to the Internet and later published online. That’s an awesome achievement! However, minutes after the announcement, I was very disappointed to find out that the streams are actually provided in a proprietary format and through a proprietary streaming protocol: a Microsoft streaming service that provides Windows media streams. Why stream an open source conference in a proprietary format with proprietary software? If we cannot use our own technologies for our own conferences, how will we get the rest of the world to use them? I must say, I am personally embarrassed, because I was part of several audio/video teams of previous LCAs that have managed to record and stream content in open formats and with open media software. I would have helped get this going, but wasn’t aware of the situation. I am also the main organiser of the FOMS Workshop (Foundations of Open Media Software) that ran the week before LCA and brought some of the core programmers in open media software into Wellington, most of which are also attending LCA. We have the brains here and should be able to get this going. Fortunately, the published content will be made available in Ogg Theora/Vorbis. So, it’s only the publicly available stream that I am concerned about. Speaking with the organisers, I can somewhat understand how this came to be. They took the “easy” way of delegating the video work to an external company. Even though this company is an expert in open source and networking, their media streaming customers are all using Flash or Windows media software, which are current de-facto standards and provide extra features such as DRM. It seems apart from linux.conf.au there were no requests on them for streaming Ogg Theora/Vorbis yet. Their existing infrastructure includes CDN distribution and CDN providers certainly typically don’t provide Ogg Theora/Vorbis support or Icecast streaming. So, this is actually a problem founded in setting up streaming through a professional service rather than through the community. The way in which this was set up at other events was to get together a group of volunteers that provided streaming reflectors for free. In this way, a community-created CDN is built that can deal with the streams. That there are no professional CDN providers available yet that provide Icecast support is a sign that there is a gap in the market. But phear not – a few of the FOMS folk got together to fix the situation. It involved setting up Icecast streams for each room’s video stream. Since there is no access to the raw video stream, there is a need to transcode the video from proprietary codecs to the open Ogg Theora/Vorbis format. To do this legally, a purchase of the codec libraries from Fluendo was necessary, which cost a whopping EURO 28 and covers all the necessary patent licenses. The glue to get the videos from mms to icecast streams is a GStreamer pipeline which I leave others to talk about. Now, we have all the streams from the conference available as Ogg Theora/Video streams, we can also publish them in HTML5 video elements. Check out this Web page which has all the video streams together on a single page. Note that the connections may be a bit dodgy and some drop-outs may occur. Further, let me recommend the Multimedia Miniconf at linux.conf.au, which will take place tomorrow, Tuesday 19th January. The Miniconf has decided to add a talk about “How to stream you conference with open codecs” to help educate any potential future conference organisers and point out the software that helps solve these issues. UPDATE: I should have stated that I didn’t actually do any of the technical work: it was all done by Ralph Giles, Jan Gerber, and Jan Schmidt.